When walking through the streets of Warsaw it’s hard to miss the fact that the city is covered with mermaid statues, drawings, carvings, and other forms of decoration. This is no coincidence, as the fish-tailed mythological creature has been seen on the Varsavian coat of arms from as early as the 14th century. Ruins of a late 1950s Polish ski jump ramp in the middle of the city. 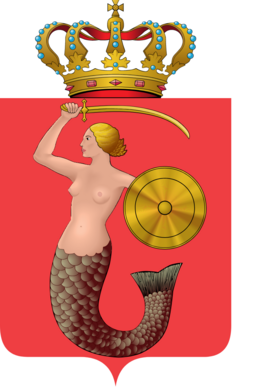 The legend of the Warsaw mermaid, or “syrenka” in Polish, is a relatively simple one. She originated from the Baltic Sea, where (according to some versions of the story) she had a twin sister, the famous Little Mermaid of Copenhagen. 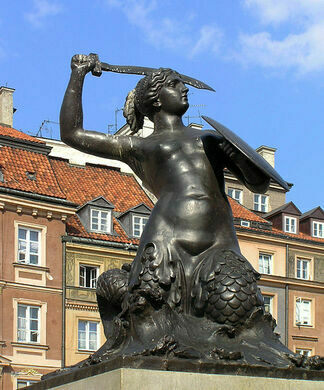 The syrenka swam up the Vistula River until she was at what is now Warsaw’s old town. There, she saw some fishermen catching fish and decided to meddle with their nets and free the catch. The fishermen were angry at the meddlesome creature and tried to catch it, but once they saw the mermaid and heard her siren song they could not harbor any hate for her any longer. Later, the mermaid was captured by a rich merchant who wanted to haul her off as some kind of prize. But the fishermen would not have it and freed her from the greedy man’s clutches. The mermaid was thankful and promised to protect the fishermen and their homes from then on. From that moment, she became the city’s guardian and protector in times of need. This statue in Warsaw’s old town is often seen as the “official” depiction of the iconic guardian mermaid and is the one that sightseeing tours stop at. But of course there is no reason not to look for the other mermaid symbols that can be seen all throughout the city. The mermaid statue is free to access. In winter it may be difficult to get too close though, as a skating rink is usually built around the statue. This bell stars in a tragic love tale and is said to make wishes come true.